After landing in Seattle I was much in need of some comfort food to calm my nerves from something I'd rather not do, flying. My friend from childhood, with her two daughters, picked me up from the airport. On our way to the hospital, we passed through China town and stopped by the House of Hong for a lunch of dim sum. Dim Sum, to me, is kind of like having tea and sandwiches for brunch but with Chinese food instead. The phrase means literally "touch the heart" or "order to your heart's content" because that's what is done*. 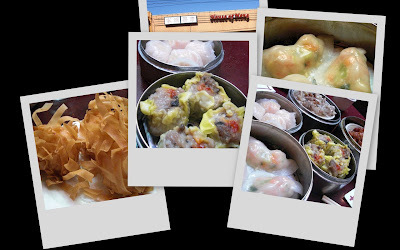 The first time I had dim sum, the concept of the waitresses pushing food carts around, offering food from it served in little steamer baskets filled with prepared food. There was not a food menu to look at; I only needed to pick whatever I wanted to taste from the cart. Each cart held an assortment of different things from dumpling and vegetables to dessert. The server would then stamp the ticket on the table; one stamp for each basket taken from the cart. Dishes are served in small portions, just enough to enjoy a couple bites if you're sharing lunch with a friend. ...and others I've never tried (or had the guts to try) like steamed chicken feet in black bean sauce. 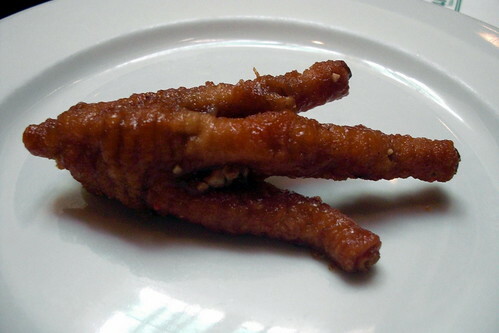 I won't hesitate to eat beef tripe and tendons in a phở beef noodle soup but there's something about chicken feet--that is where I draw the line. I have no doubt it tastes good (it certainly had a mouth-watering aroma). My friend's daughters LOVED it; it's their favorite thing to order, but I think the talons look very alien like. I mean...how can I bring myself to eat something that resembles a cousin of E.T.?!?! We were there pretty early so the crowd was missing. It was nice because the servers were very tentative to us. I haven't had dim sum in years so it was good to share some food that "touch the heart", especially with a friend I haven't seen for over a decade and her sweet daughters!